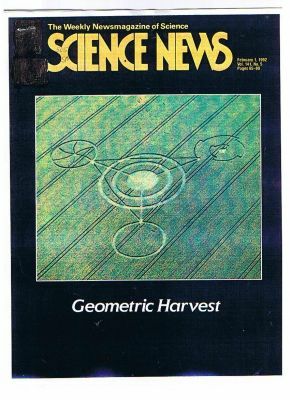 The Barbary Castle circle on the cover of the February 1, 1992 Science News. It shows the explosion that vaporizes Earth and says, "In seven units of time you fry. So "what time unit?". I realized the E-Ts were using base 7 = six spokes in the circle in Barbary Castle. It was placed down at around 1:35 AM GMT on July 17, 1991. The first piece of the Shoemaker-Levy comet hit exactly three years later on July 16, 1994 at 20:00 UT, showing the E-Ts time unit = 3 Earth sidereal years..
On July 12, 2012 I realized the "Missing Earth" showed us when the 21 year countdown started with the positions of its remaining planets. The BC circle showed us being vaporized in 7 units by our "conservation debt" made of Anti-Matter. I did not know what the E-Ts who placed it down had in mind for us. Were they being helpful or were they 'eating us'? Given the abductions and 'cattle mutilations, I think saving our genes and perhaps a few individuals is the most help we can expect from them.